Spectroscopy is one of the most advanced and famous analytical technologies used extensively in large number of fields, from healthcare to manufacturing. Spectroscopy is the measurement of interaction between radiated energies emitted by certain matter. Globally, growing demand for efficient and accurate imaging system, the adoption hybrid imaging technologies such as PET/CT, continuous improvement and innovation in Molecular Spectroscopy technologies and growing population are the prime growth drivers of molecular Spectroscopy market. In addition, Increase in adoption of Molecular Spectroscopy for newer applications, and emerging economies such as China, India and others, will create new opportunities for molecular spectroscopy market. However, higher cost of the research and development, are the key restraints for molecular spectroscopy market. Geographically North America dominated global molecular spectroscopy market, because of high investments by Federal government for research in the area of medical sciences, and technological advancement. Asia Pacific is projected to have fastest growth, owing to rapidly increasing population, rise in consumer awareness, favourable government policies, modernization of healthcare infrastructure, and growing medical tourism industry in developing nations such as China, and India in this region. This report identifies the Molecular Spectroscopy market size in for the year 2014-2016, and forecast of the same for year 2021. 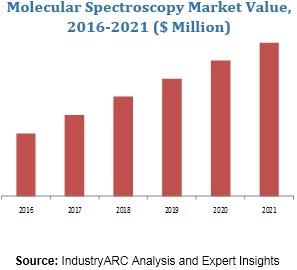 It also highlights the market drivers, restraints, growth indicators, challenges, and other key aspects with respect to Global molecular Spectroscopy market.